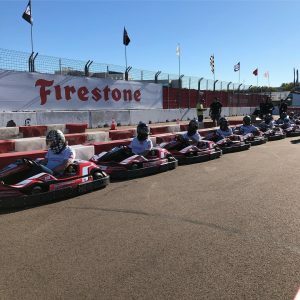 As part of our ongoing campaign to support local non-profits, Pinstripe chose Kart 4 Kids as our beneficiary for 2019. Each year the Kart 4 Kids team hosts a Pro-Am kart race to raise money for Johns Hopkins All Children’s Hospital. More about that later. After meeting with the Kart 4 Kids team to determine their needs, we embarked on several months of building a public relations campaign that included press releases and distribution to local news and online outlets, pitching morning shows to gain Kart 4 Kids an even broader audience, and video and photography to build a more substantial media library to use for marketing collateral. Our first campaign was a huge success and the Kart 4 Kids team was thrilled. We were able to place them on interviews with Bay News 9 and Great Day Tampa Bay. Indycar champion and hometown hero, Sebastien Bordais, spoke about Kart 4 Kids and Jenine Rabin from Johns Hopkins All Children’s Hospital Foundation talked about the hospital, the life-saving equipment the fundraiser has purchased, and the impact community has on direct patient care. Patient ambassador, Clifford Mason, was able to attend the Great Day Tampa Bay segment to talk about his experience as a patient of the hospital. All did a great job, see for yourself in the clips below. Besides providing great PR for Kart 4 Kids, we took this sponsorship to a whole new level. Pinstripe Marketing put together a Pro-Am kart racing team and, though our race team didn’t win, Johns Hopkins All Children’s Hospital did! They received a whopping $185,000 from the Kart 4 Kids efforts, which included sponsored Pro-Am teams, a live auction with items such as a helmet worn by esteemed local IndyCar driver Sebastien Bourdais, a silent, online auction with items that included a race-worn suit signed by Tony Kanaan, driver signed artwork and photos, and many other items. 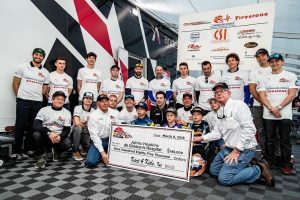 In the last eight years since the first Kart 4 Kids race, the organization has raised a total of nearly $600,000. The Pinstripe team Pro Driver was Matheus Leist from Brazil, who is an IndyCar Series driver for AJ Foyt Racing. Other household name pro drivers included Patrick Long, Scott Dixon, Tony Kanaan, Santino Ferrucci, and Simon Pagenaud. 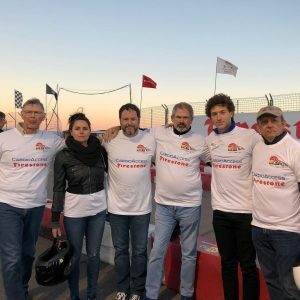 Kart 4 Kids Inc is a 501(c)3 organization established to raise money for Johns Hopkins All Children’s Hospital by organizing the Kart 4 Kids Pro-Am Kart Race. The all-volunteer staff means that All Children’s receives all proceeds net of direct race expenses. Now in its 8th year, the Pro-Am kart race was started in 2012 to honor the memory of IndyCar driver and St. Petersburg resident Dan Wheldon, who had tragically perished in a racing accident. Starting with American Porsche factory driver, Patrick Long as its only professional driver in the first race, the race has been embraced and supported by many of the best racing professionals in IndyCar, IMSA, and Pirelli World Challenge, among other series. Patrick has been joined by early supporter Sebastien Bourdais as the two featured drivers. 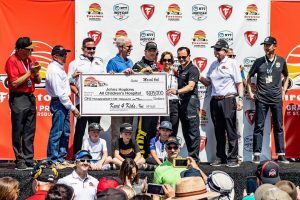 From its small start, the Kart 4 Kids Pro-Am Hosted by Andersen Racepark, Featuring Sebastian Bourdais and Patrick Long has become one of Johns Hopkins All Children’s top third-party fundraisers by donating $130,000 in 2018. For more information visit www.Kart4kKds.org, ‘like’ its Facebook page at Kart4Kids Pro-Am Kart Race, or follow the race on Twitter @kart4kidsproam. In the past few years, we’ve seen a whole bunch of public relations disasters. Hollywood has been wracked with them, from famous celebrities to powerful executive producers. Some were handled quickly and with compassion, while others not so much. We have also seen major corporations suffer the fate of PR mismanagement. Some are still trying their best to regain consumer confidence. You may be wondering why all of this matters. Well, it’s because consumers say authenticity is important when choosing the brands they support. This means that any missteps by their PR departments can derail their fiscal goals. We’ve got some great examples that any business, big or small, can learn from. In 2016, Wells Fargo had a crisis of major proportions. When the public learned about employees at the bank creating over 2 million fake accounts, customers and shareholders felt betrayed. What made this crisis worse was the PR nightmare that followed. Executives tried to cover up the problem. Then, they couldn’t get their story straight. It was obvious that they were lying to our faces. Today, the bank’s stock is rated as “Sell” and their current campaign to build trust is having little impact. Too little too late. Had the company been open and more transparent about their problems, they could have stopped the bleeding immediately and worked quickly to gain consumers’ trust. When a company appears to be covering something up, or being dishonest, that’s when the media really takes an interest and starts digging into the story—often making more trouble than usual. Honesty and authenticity are the best policies in public relations. In April of this year, Southwest Airlines suffered an enormous setback to their reputation when an engine blew up mid-flight, killing one person onboard. Luckily, the airplane landed safely and the entire fleet was grounded. At the time of the accident, the Southwest crisis communications team went into action, communicating brief statements on social media and online networks. When they had the complete story to share, they provided the media and the general public with a written statement and a heartfelt video statement by their CEO. Both have a conciliatory tone and avoid the boilerplate tones we so often hear in media coverage. Both are authentic and reassure future passengers that they care about getting them safely to their destinations. Reputation management is much the same for small and midsized businesses. There will always be threats to reputation from within as well as outside the company. One of the best ways to prevent a PR nightmare is to be proactive. This means showing all of the good things that happen in your organization on a regular basis (not just as a reaction to a crisis). Show how your employees engage with clients and the community, because these can help drown out that one, unexpected bad thing that comes along to damage your hard earned reputation. When a crisis does occur, take a hint from Southwest Airlines’ CEO. Respond as soon as possible after you are completely informed about the situation, respond in a sincere manner on an appropriate platform (sometimes video makes sense, sometimes written), and promise that you are doing your best to rectify the issue and prevent future issues (because you are and you should be). The Pinstripe PR team can answer any questions you may have about PR crisis preparedness, so reach out if you are interested in planning ahead.